We did not want to give up the lifestyle, We Loved. 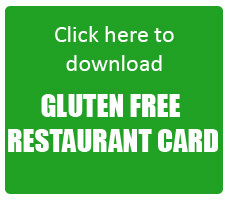 So, Celiac Society has decided to help you in some much needed and novel way to express your need whenever you go to eat out in any restaurant/hotels. In verbal communication, service staff (Waiter/Waitress etc.) 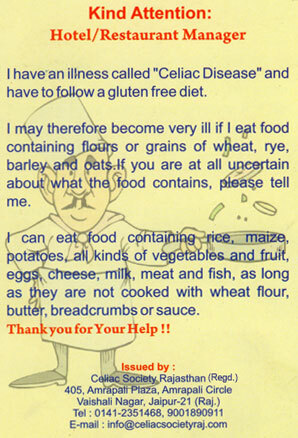 may not be able to understand your disease/ need for gluten free diet. 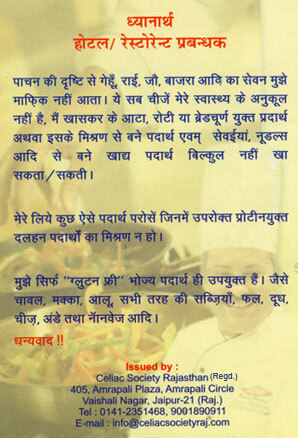 Subsequently in making understand to chef, it may not carry clear and “APT” message. 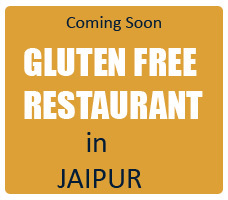 Celiac Society Rajasthan endeavor to provide you “Gluten Free Restaurant Card” will carry you, “ The Right Movement” to speak to service staff and they will really pleased to get the “CARD” to avoid the pressure of understand your actual request. Subsequently, conveying the same not verbally to their chef. You become relaxed, just feel better by not only avoiding “Gluten” but simply you feel good about looking after yourself, you just feel lighter.